* In highly exceptional cases where income exceeds PhP300,000.00, the CHEDRO StuFAPs Committee shall determine the merits of the application. 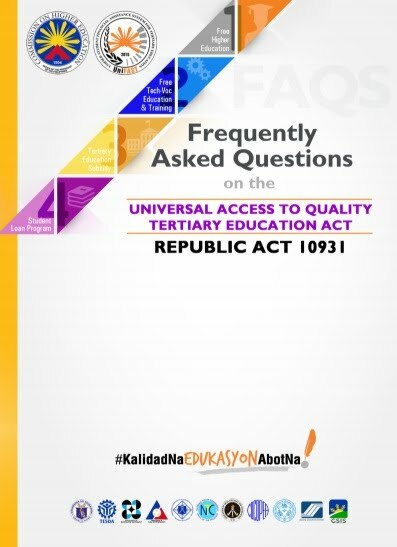 Any one of the following: Latest Income Tax Return (ITR) of parents or guardian, Certificate of Tax Exemption from the Bureau of Internal Revenue (BIR), Certificate of Indigency from their Barangay, Case Study from Department of Social Welfare and Development (DSWD), or Affidavit of No Income. For children of Overseas Filipino Workers (OFW) and seafarers, a latest copy of contract or proof of income may be considered. III. If you are qualified, accomplish the CHED StuFAPs Application form. IV. Submit the accomplished CHED StuFAPs Application, together with pertinent documentary requirements, directly to the CHED Regional Office concerned. Sample Notice of Award, please click here. How do I get my StuFAPs Award? or Call Kriz or Flor at 0925-824-5146 or 0912-089-2045. What will I do after I receive my StuFAPs Award? Accomplish the lower portion of the award form and send back to CHED Caraga. 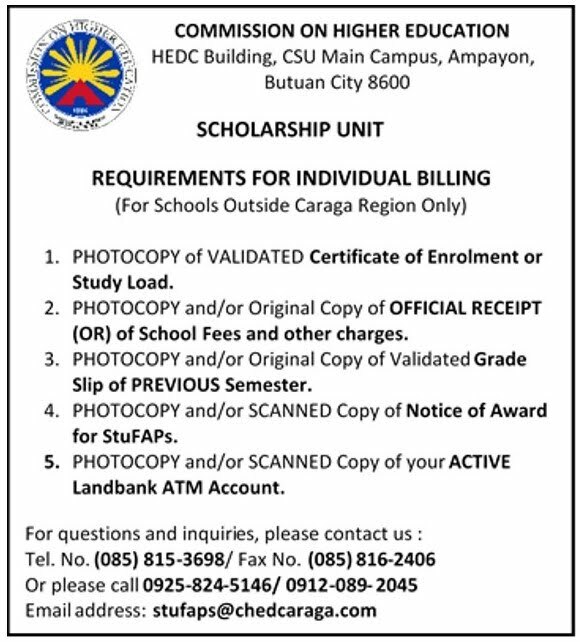 Report to the school's scholarship coordinator, submit a photocopy of the CHED Notice of Award. What are the terms and conditions of the Award? 9.5 Request approval from CHEDRO to defer enrollment during the semester for meritorious reasons for not more than one Academic Year in the whole duration of the academic program. What are the grounds for termination of the scholarship/grant/loan? 10.5 Transferring to another HEI/academic program without approval from the CHEDRO.